I am so excited for the Holidays to begin. 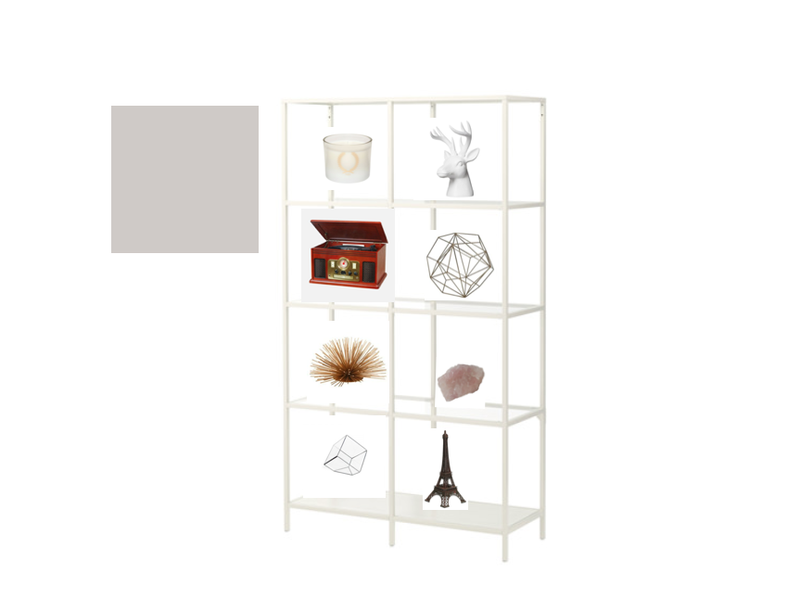 For todays Makeover Monday post I am going to show you the concept design of another wall in our living room. This wall is to the right of last weeks post. I don't know why but I absolutely love open shelving. It gives you a way to show of your knick knacks in a tasteful way. And let me tell you... I have a lot of knick knacks. We got the white shelf from Ikea and I love how it pops against the gray wall. I added my knick knacks that I felt matched the front room's color scheme and overall theme. I originally wanted to add two smaller shelves at either end but I am currently loving how the shelf looks on its own. Something else that I love is how easy it is to add a few Holiday items on the shelves to make them festive. I recently added a few Halloween items in and it gave it a completely new look. I cannot wait to decorate for Thanksgiving and Christmas!